An impressive demonstration marched through the streets of Rome in answer to last weeks’ evictions. Refugees and Italians marching side by side for the right to a house, dignity and for an open and supportive city. The institutions are postponing a negotiating table and the refugees remain in a permanent sit-in near to Piazza Venezia. Originally published by Dinamo Press, translated by Michele Fazioli. 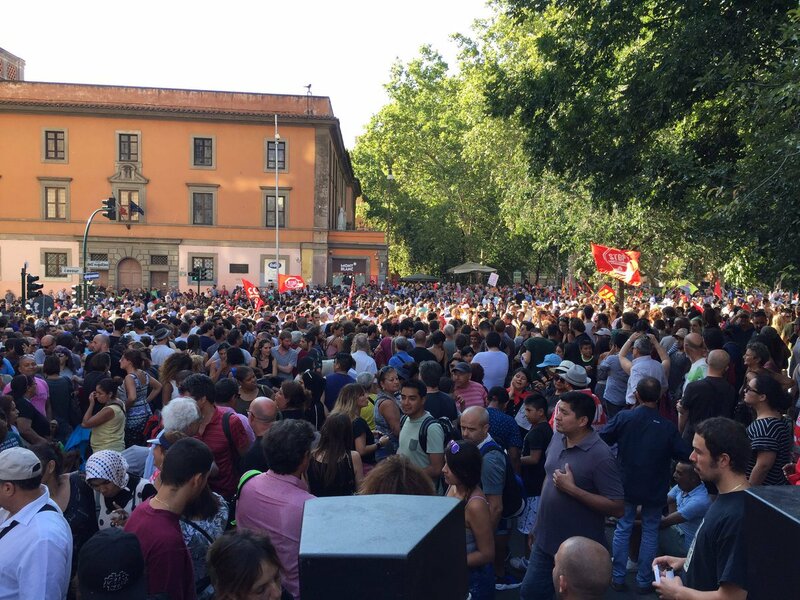 When the long snake-shaped parade narrowed its way down Via Cavour, the perception of the impressiveness of the protest becomes clear to everyone: at least 15 thousand people, maybe even more. On the lead, the Eritreans and Ethiopians evicted from the building in Via Curtatone and protagonists of fraught days of struggle and resistance. Many women, both on the first row and on the microphone. A little further back, the wide segment of the housing movement led by the banner “Housing struggle has no borders”. Following, the squatted social centres, the associations, the RomeDecides network, the organized migrant workers of the USB union and a wide number of supportive people who, from all over the city, decided to participate to the march and show solidarity to the homeless. By the end of the rally, even a Franciscan monk in his tunic has been spotted and cheered from the microphone. This is the answer of the best part of Rome to those who threw hundreds of people in the middle of the street in this torrid august, first by evicting 80 families from the building in Via Quintavalle in Cinecittà and then by attacking the refugees in Piazza Indipendenza. No political solution whatsoever, only batons and water cannons. “We are human beings, running from wars, dictatorships and hunger. We deserve respect. We transformed an empty building in a home without begging anything to anyone. They violently threw us out. What should we do now? House has to be a right for everyone” speaks a young man from the microphone. “If the Italian State does not want to treat us like human beings and grant us our fundamental rights, then he must let us go. A lot of us tried to work in other European countries but have been bounced back here because of the Dublin Regulation. The Government uses the iron fist against us, the poor, but it is that same Government who signed the laws that keeps us trapped here” says another one. Various were the issues coming from the interventions articulating the protest: house and social rights for everyone, freedom of movement, denial of subsidiary policies, demand for the release of the three men and two women detained (the latter were liberated later today). A former occupier of the building vigorously replied to the accusation of the Attorney, according to which rent fees were demanded inside the building: “Those who had money participated to the maintenance and cleaning costs of the building, but no one ever asked for a rent. A lot of the occupiers are jobless, therefore they do not even have the money”. The parade ended in Piazza Venezia, right in front of the line of police’s armoured vans blocking Via dei Fori Imperiali, while Mounted Police “occupied” the open space of Madonna di Loreto. The protesters demanded for an inter-institutional negotiating table with the Municipality, the Region and the Prefecture’s office aimed to find an effective solution for the hundreds of people forced to sleep in the streets for the past days. Once again, the institutions decided to bury their heads in the sand. Speaking through the officials on the ground, they postponed to next Monday the decision about the negotiating table, maybe only to try to deny the legitimacy to negotiate expressed by the mobilisation. In answer to this, the evicted of Piazza Indipendenza decided to camp in a permanent presidium in Piazza Madonna di Loreto, close to Piazza Venezia. They will wait there for the table to be accepted. In order not to disappear, to stay united, to bring the results of the nefarious policies of evictions and repression right in front of the city centre’s buildings. They will stay only few metres away from the families kicked out of the occupied building of Via Quintavalle: they have been sleeping in the streets for days as well, in Piazza Santi Apostoli, waiting for answers by the institutions. Some people of the Enough is Enough team will join Cars of Hope on their mission in Greece (From September 14 until September 20). Support refugees in Greece! Crowdfunding campaign: Click at the banner (at the left) to donate. Next post: #Portland: Stand Up! Community Defense Against Patriot Prayer!